This guide provides details on how to debug PowerShell scripts while they are being deployed by Octopus Deploy to remote machines. This guide demonstrates connecting via IP address to an untrusted machine on a public network. Some steps may be omitted when connecting to machines on the same subnet or domain. PowerShell remoting must be enabled on the remote machine and configured for SSL and the trust established between the remote machine and the debugging machine. $certificate = New-SelfSignedCertificate -CertstoreLocation Cert:\LocalMachine\My -DnsName "$dnsName"
Export-Certificate -Cert $certificate -FilePath "C:\remoting-certificate.cer"
Import-Certificate -Filepath "C:\remoting-certificate.cer" -CertStoreLocation "Cert:\LocalMachine\Root"
PowerShell debugging is enabled by adding the project variable Octopus.Action.PowerShell.DebugMode and setting the value to true. Now, create a release and deploy it. The deployment will pause while waiting for a PowerShell debugger to attach. 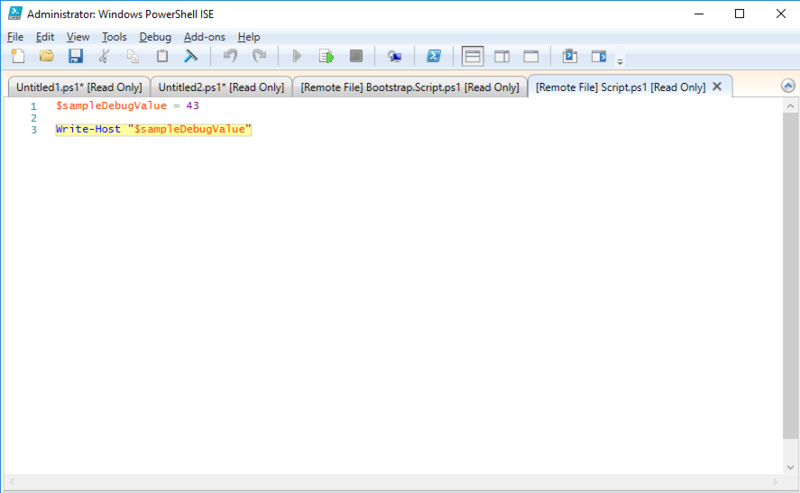 PowerShell ISE will open a window showing the script currently executing on the remote machine. You can step through the script using F10 to step over and F11 to step in. When you are finished debugging, run to the end of the script and the deployment will be complete.